Discussion in 'Thumpers' started by neepuk, Mar 6, 2015. I'm very new to the 690 and just saw a post from another inmate that gave me the idea of starting this thread. I hope it catches on as it would really make things easier for those of us that have the newer 690 models. I read so much information in the WUNDERFEST that does not apply to my bike because I didn't know of a few major differences between the earlier models and the 2014/2015 models. Here is the post that has given me the inspiration to start this thread. I have a 14' 690 and a 13' 990. Let me clear up some common questions and comments for newer owners. 1) starting in 2014, the 690 cannot connect to tune ECU. Dealer must flash new maps. 2) twitchy throttle does NOT include 2014 and later 690s. When comparing STOCK maps, the difference between my 13' 990 and 14' 690 is incredible. Makes me want to kick my 990 to the curb. 3) The 2014 and newer 690s are ride by wire throttle and a dual spark motor, similarly found in the 690 duke. 4) Maps from 2013 and older 690s are completely different than 2014 and newer. The 2014 motor is a different animal and discussions of MPG, throttle response, and air fuel ratio (lean or rich) must be separated. 5) A slip on Wings exhaust with EITHER DB killer installed does not need a new map unless you do air box modifications. Please join me in posting up more differences and 2014/2015 690 specific information only. Mine will be in my garage in a few weeks. Looking forward to this thread. Thanks for starting. Great thread idea and I'm sure there are others that will appreciate the separation due to the technical differences. To add to the discussion, here are a few notes I pulled from my list of things to do on my '14. 1. Exhaust mods: Complete kits are available from Arrow, Akro, and FMF in addition to the popular Wings muffler. 3. ECU mods: PowerCommander with/without the Autotune box (read about it here, and do a vehicle search on the UK Dynojet site for the 2014. Vortex ECU is listed under the fitment section at ktmtwins. 6. Levers were initially difficult to find with the switch to fly-by-wire. MG-Tek have replacements/upgrades and ktmtwins is taking pre-orders for FR Racing levers for 14's. I'm sure there's plenty more to add to the differences and must-do's on the 14-15's.... just a short list of what I'm researching for my bike. I'd really like to find a Pod air filter that wasn't a K&N for the EVO 2 intake setup. I ride in the sand and dust of SoCal and the K&N makes me cringe a little. There is nothing from Power Commander(unless the one for DukeR works) or Vortex for 14-15's. Please disregard a PM I sent you...........it was answered in #5. The Walrus Gone and back again. Has anyone customized their stock suspension settings? I'm very curious to hear how you set your forks and rear suspension for your riding and size. I just spoke to a dealer who told me that none of his customers has yet requested a custom set up. He's also had several guys who have complained of "choppy" handling yet they've stayed with the stock set up. I'm not talking about revalving or spring replacement but simply adjusting within the range that WP provides out of the box. I'd also like to hear where your bike was set when you got it, they're often set on the harsher road or sport settings. Alot of people are using super plush of Konflict to have there suspensions tuned. I dont really have enough on mine yet to see how i want mine changed. I believe i read somewhere on here that the 14's and up can still have there legs lenghtened to the 300mm suspension, but it involves some custom work to the internals of the forks due to the 14's and up having the forks set up different from factory ie; one fork is for rebound and one for damping i believe. - muffler only has one mounting bolt instead of 2 on the older models. That said if you do come a cross a good deal on an older silencer then the mounting bracket from pre 14 can be purchased and bolts on. - only one computer compaired to pre 14's that have 2 comouters under seat. - no SAS garbage to remove. 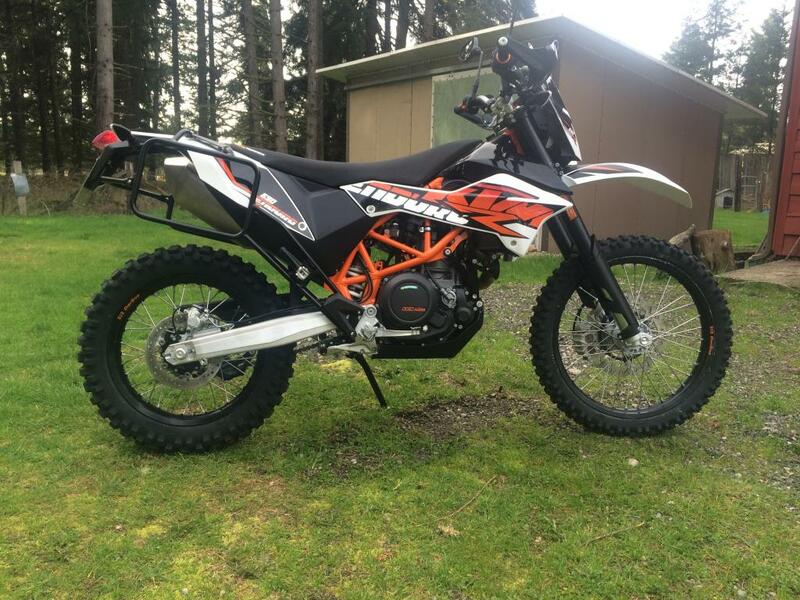 Well glad to see this thread started as I just picked up my new 2015 690 two days ago. So far I've ordered CJ rear cap kit, Perun tank bolt kit, Wings can and I'm about to order a foam filter. My question is the touratech filter kit fit right compared to the KtmTwins which I've heard has fitment issues? I'm pretty sure the Hardparts is just made by Uni for them to market. So touratech and hardparts is the Australian Uni kit? Sorry for the long winded question. Here she is when I got her home! yamtastic, hidsrtktm, Mainrollman and 1 other person like this. Sharp looking bike man! As far as i know the hardparts is just the Aussie Uni you just pay more for the Orange color. The fitment issues is due to excess plastic around where the filter seats. In the next few days i will be clearing mine out and i will take some pics of before, the process, and after and post up here. Also a few little hacks i have borrowed(stolen) from the great guys on this site will be implemented on my bike in the next few days when i get the bolts. I will put up the information as well as pics of it for anyone else who wants to do the same. So this is news to me, and another reason I'm glad this thread is already growing! There no SAS on the 14/15? So the only smog crap that needs to go is the canister and all the associated hoses that go with it? Sticking with your request to not talk about revalving or spring replacement----for me--------I've found the rear shock to be perfect and the front suspension-----------no matter what you do--------------to be absolutely horrible. On the softest settings the front deflects so bad I've thought the thing was going to kill me a few times in the rocks----not even brutal ones. I think my wheelbarrow is better. My 1974 Bultaco Pursang had better front forks. And my Yamaha WR250R has perfect front forks------wish I could stick them on there. The oil pressure sensor was added in '12. 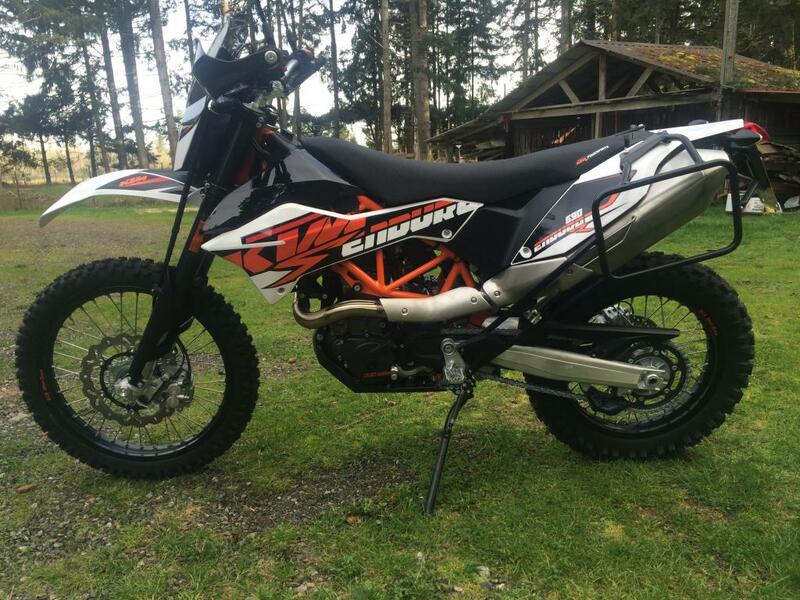 I bring to the thread my one week old Enduro 690. Can we share our experiences here? Still breaking in, and avoiding RPMs over 4500 I got 192km (120mi) on my first tank before the fuel reserve light turns on. 14s and up don't have SAS. They still have the canister. I removed mine asap and replaced the valve with a resister. I built a bunch and sold em for $15 for beer money! whose pannier racks are those pls dan? A fellow 2014 owner, GPS, posted his install of the PC V and Autotune in addition to making his maps available. Read about it here. Good thread!! 14/15s need this thread !! Hard parts made by touratech. I dont understand the need for a power commander, yes for now there is no way for us to reprogram the ecu but stealerships can reprogram it for you. Maps for pre 14 bikes also don't work on the 14+ bikes as far as i know.